For his short show in the second room of the freezing environs of the Motion warehouse, former Beta Band member Steve Mason showcased a selection of songs from his excellent 2013 album Monkey Minds in the Devil’s Time, as well as his upcoming release Meet the Humans. 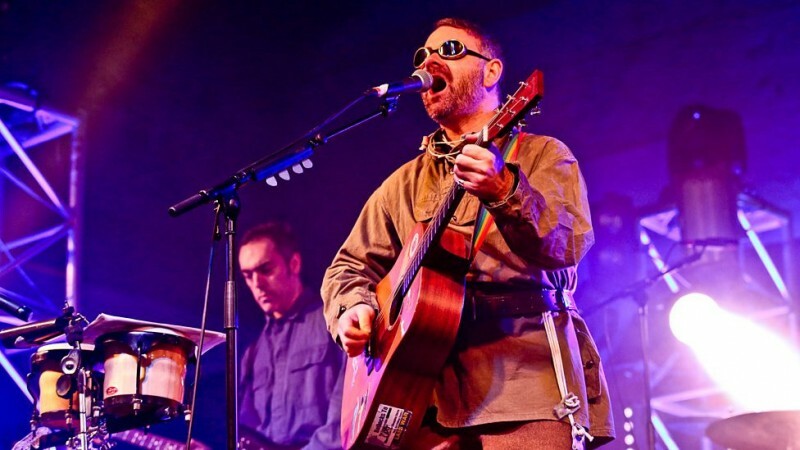 Greeting the audience in quasi-military clothing and steampunk sun goggles, Mason kicks off with ‘Oh My Lord’ with its industrious basslines. Referring to his potent politicism and short 45-minute set, he assures the crowd that there will be “no big speeches as we have a lot to get through, although I have written one just in case.” ‘Planet Sizes’ from Meet the Humans, full of euphoria in its refrain of “I’m Fine.” ‘Seen It All Before’ again signals Mason’s firebrand intent. 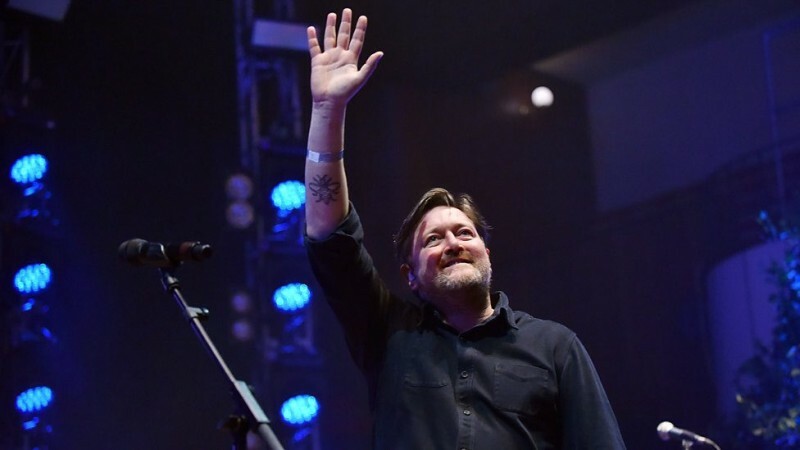 It is announced with “we don’t want to talk about that too much, we don’t want to get too political here,” a reference to the fact that the gig is live on BBC Radio 6 Music. The set is complete with an excellent rendition of ‘Fight Them Back’, with it haunting refrain of a recording of Tony Blair calling Libya a “potential goldmine.” Mason’s set is a fine example of a performance by an impassioned man at the peak of his game. 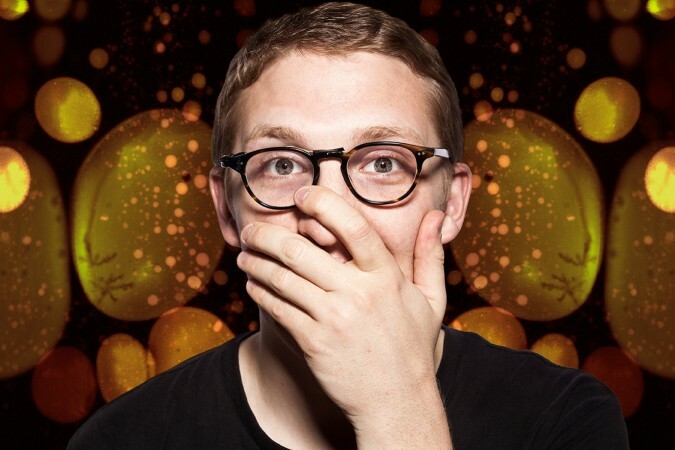 As Gilles Peterson introduced Floating Points to the stage at the Trinity Centre, is was clear that something special was about to happen. The musical project of Sam Shepherd has produced some of the finest dance music of the last few years, and this gig presented the opportunity to see him perform Elaenia, one of the outstanding albums of 2015, with an 11-piece band. Sunday afternoon is a strange time to see Floating Points. Usually his gigs and DJ sets are witnessed by saucer-eyed revellers in the early morning, but the slot is in keeping with the nature of his latest work. Elaenia is a departure in many ways from his other music, and offers everything from the jazz funk of ‘Silhouettes’ with its soulful brass jam to the more prog-rock stylings of ‘For Marmish’. Best of all is ‘Kuiper’, which sees Shepherd return to his techno roots in thrillingly minimalist fashion. The set is made complete by an incredible laser show, in which bright blue patterns are beamed onto a phosphorescent screen, leaving a trace of dying green glows like an over-excited oscilloscope. It’s Steve Lamacq who ends the murmur of anticipation from the packed Colston Hall audience as he kicks off Sunday’s BBC 6 Music Fesitval’s ‘By Night’ programme with his introduction of Elbow frontman and fellow 6 Music cohort Guy Garvey. Lamacq’s comparing him to that of a “musical hug” proves somewhat apt as Garvey delivers of delightful set full of affability and avuncular warmth. My hitherto uninformed typecasting of Garvey as a musical miserablist is blown out of the water as he leads a crowd clap-along to ‘Belly of the Whale’, a skipping slice of funk driven by bass, clean industrial guitar chords and three piece brass section. There’s an amusing interlude where Garvey sarcastically brands the melodica a “dignified” instrument and “nothing like a respirator” before blowing into the absurd looking mouthpiece for the intro to ‘Juggernaut’. Even during the more ponderous moments, the lightness of touch never deserts the 45 minute set; ‘Yesterday’ is introduced as a “song about sexual deviancy” and playfully dedicated to Shaun Keaveny while ‘Courting The Squall’ see Garvey execute a sublime falsetto after which he communicates a “perfect” hand signal to a sound technician in the wings. Meanwhile, the mournful blues of ‘Electricity’, led by its wistful brass, is a hauntingly beautiful tribute to late musician Bryan Glancy. 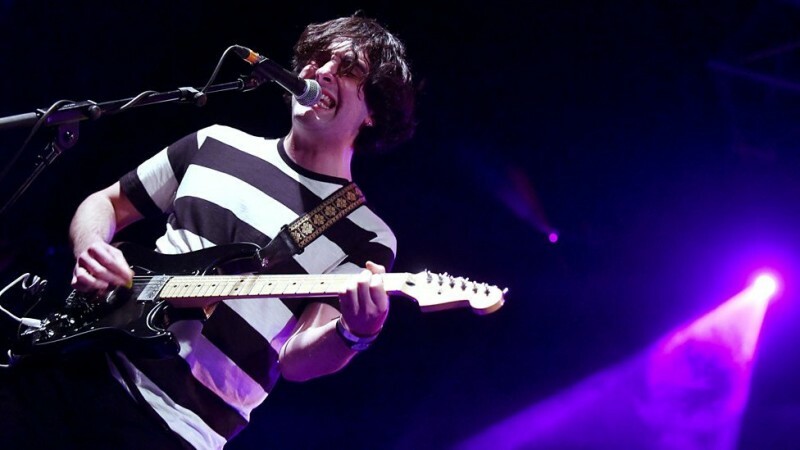 We’re fifteen minutes behind schedule at O2 Academy when Tom Robinson describes the speedy ascent of Wirral indie rockers Hooton Tennis Club with their emerging through BBC Introducing Merseyside and The Great Escape Festival. Openers ‘Up In the Air’ and ‘I’m Not Going Roses Again’ set the template of bouncy indie with circling chord progressions, noodling riffs and shared lead vocal duties between guitarists Ryan Murphy and James Madden. There’s also a clear penchant for loquacious song titles in ‘Something Much Quicker Than Anyone But Jennifer Could Imagine’ and ‘And Then Camilla Drew Fourteen Dots On Her Knee’. The set rarely fails to poke its head over the parapet of generic indie rock and it is probably both a combination of this and the late start that explains the partial audience exodus to Colston Hall for Julia Holter’s 6pm performance. Early single ‘Jasper’ is more like it; an infectious, spiralling guitar riff sheds some light on the band’s ability to deliver satisfying guitar pop. An eye on the clock causes me to miss what I later discover to be the finale of the summery ‘Always Coming Back 2 U’ and the playful ‘P.O.W.E.R.F.U.L. P.I.E.R.R.E’, two of the group’s standout tunes. It’s unfortunate as both just may have been better vindications for the band’s rapid ascendancy. 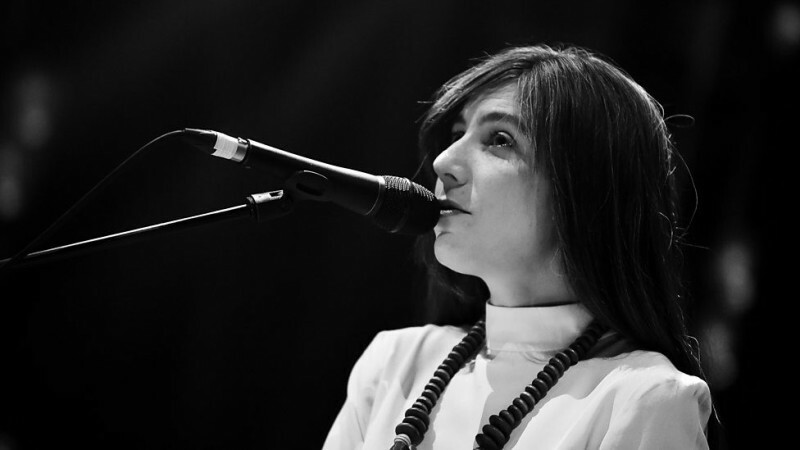 Julia Holter’s latest album Have You in My Wilderness is described by enthusiastic champion Mark Radcliffe as a record that “exists in its own world” and the adjective “otherworldly” is perhaps most befitting the Los Angeles artist’s theatrical, avant-garde subversion of pop. This is instantly apparent with ‘City Appearing’, a sparse, seemingly shapeless palette founded on murmurings of bowed double bass and viola. Meanwhile ‘Silhouette’, a newer song, is more conventionally structured and its strong melodies reveal a songwriter’s ear for a hook to underpin the arty experimentalism. As someone who has previously written songs based on French novels and Greek tragedies, the changing moods of Holter’s songs often have the feel of theatrical narratives. ‘Lucette Stranded on the Island’ is at once poised and forever on the verge of breaking out from the precipice of aching violin and pleading, dreamy vocals. ‘In the Green Wild’, about “escaping into the wild and experiencing trees”, is an emotive journey of off-kilter viola screams while the gentle beginnings of ‘So Lillies’ culminate in a cacophonous explosion of feeling. The sort of music that you couldn’t imagine getting too much radio play (its unorthodoxy was certainly too much for a few rapidly departing audience members), the festival is richer for Holter’s far-reaching inventiveness. There’s enough time to catch the tail end of the set by local rock band Blue Aeroplanes in Colston Hall’s crammed second room The Lantern. Chris Sharp, owner of Bristol’s distinguished music venue The Fleece, can be spotted on bass along with the curious sight of the group’s own take on the Bez-like dancing imbecile; wearing an unbuttoned shirt, a middle-aged man performs bizarre, slow-motion movements of mock ecstasy while singer Gerard Langley dons his trademark shades and appears to be reading some of the spoken word lyrics from a couple of A4 notepads. Meanwhile, as the cold February winds drift in to the building through the main entrance doors, there’s a big party going down with Gilles Peterson warming things up in the concourse area with some high energy electronica. 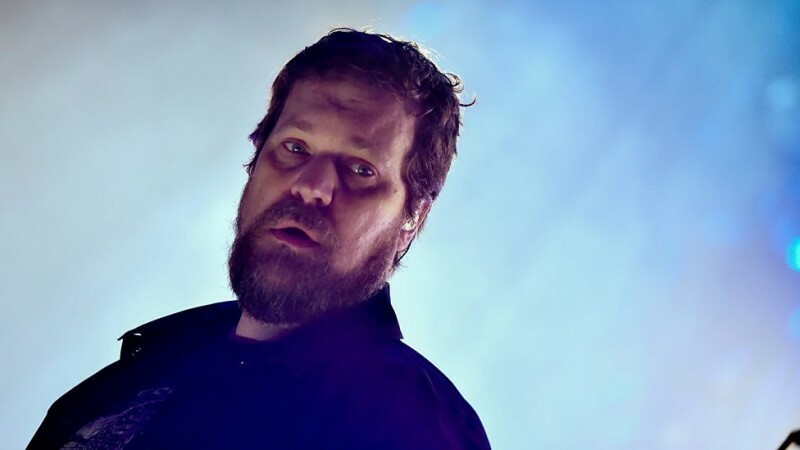 A man who, according to Tom Robinson’s introduction, “6 Music have taken firmly to their hearts”, Denver based singer-songwriter John Grant delivers a set so enthusiastically received that it may well have induced the most rapturous crowd response of the weekend. Grant casts his caustically humorous lyrics over disco stomps, bubbling electro pop, quirky keyboard balladry and huge, room filling choruses. “I wanted to change the world but I could not even change my underwear” he sings on ‘Queen of Denmark’, a track that steadily expands into something akin to an operatic journey. 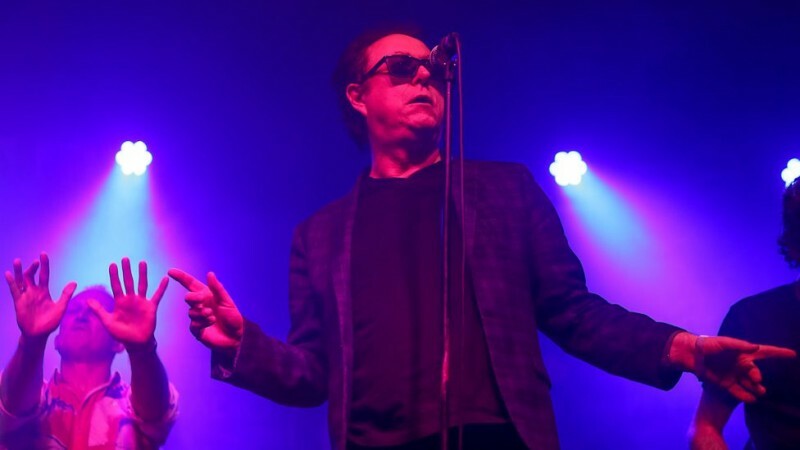 Grant thanks Gary Numan after the bouncy ‘Voodoo Doll’ which is laden with intergalactic synths and his characteristically absurdist lyrics: “I made a voodoo doll of you and I gave it some chicken soup”. The lyrics to ‘Glacier’, sung as a duet with special guest Jimi Goodwin, are so forthright in their vulnerability that they feel either cloying or awkward to listen to but, with the singalong choruses to ‘GMF’ and ‘Disappointing’, the set ends with aplomb. Grant, who throughout has made sure to communicate and gesture towards crowd members even in the upper balcony, enjoys a standing ovation from at least half of the seated audience. 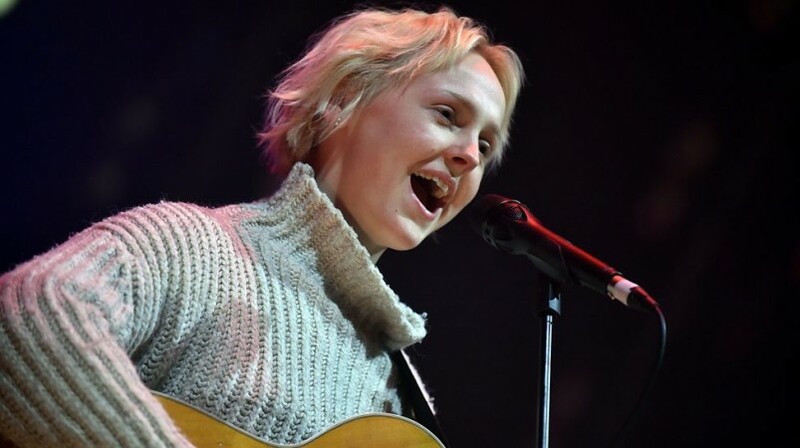 To avoid the risk of missing out on Laura Marling’s full performance with the room guaranteed to fill to capacity, a considerable number of festival go-ers secure a spot in the main hall in excess of an hour before the precocious folk artist’s appearance at 10pm. It proves to be well worth the wait and Stuart Maconie wastes little time with his introduction. Backed only with musicians on bass and drums, Marling instantly garners the full attention of the near 2000 capacity crowd with her sweet, elastic vocals during the uninterrupted four song suite from 2013 album Once I Was An Eagle. The prettiest moments come with the combination of Marling’s voice and her masterful finger-picked guitar playing; ‘Walk Alone’ aided by the brooding hum of bowed double bass is an early highlight while ‘Goodbye England (Covered in Snow)’ is strikingly beautiful. Marling, not entirely comfortable as a host between songs, expresses the pressure involved with having to provide badinage between tracks, particularly when being broadcast live on radio; paradoxically, this fills the gap ably enough between ‘Rambling Man’ and ‘Hope In The Air’. Her singing voice is all that’s needed to captivate the audience though, its versatility displayed in the spoken tones of ‘Strange’, the immaculate cooing of ‘Sophia’ and the acerbic sneer of ‘Master Hunter’. Marling offers the crowd her Valentine’s Day wishes and “much love to you all” as she brings an exquisite set to an end; having been treated to a performance of songs that sound as good as, if not better than, their recorded versions, I’m sure that the audience feel more than reciprocal in their affections. Tagged bbc 6 musical festival, blue aeroplanes, bristol, conal dougan, gilles peterson, guy garvey, hooton tennis club, john grant, julia holter, laura marling, review, scott hammond. Bookmark the permalink.